Caring for the 9 million low-income elderly or disabled adults who are eligible for full benefits under both Medicare and Medicaid can be extremely costly. 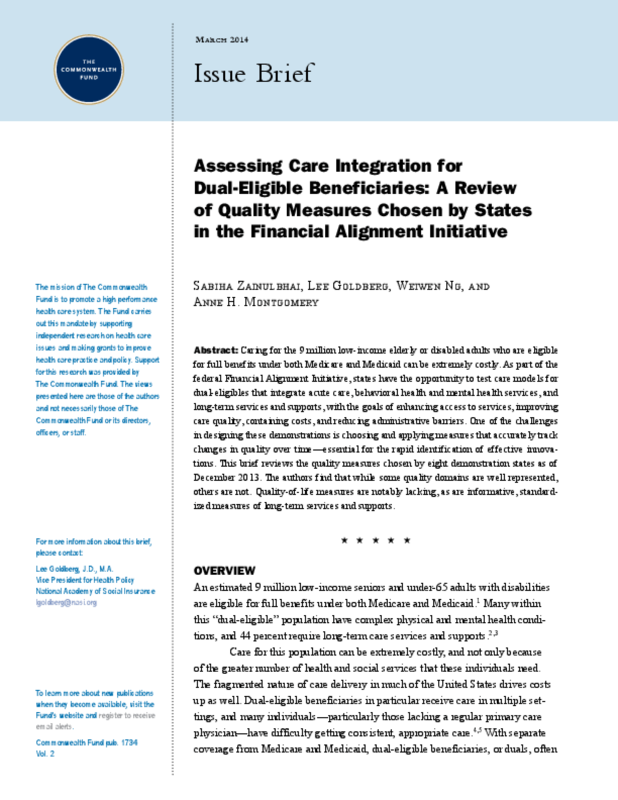 As part of the federal Financial Alignment Initiative, states have the opportunity to test care models for dual-eligibles that integrate acute care, behavioral health and mental health services, and long-term services and supports, with the goals of enhancing access to services, improving care quality, containing costs, and reducing administrative barriers. One of the challenges in designing these demonstrations is choosing and applying measures that accurately track changes in quality over time—essential for the rapid identification of effective innovations. This brief reviews the quality measures chosen by eight demonstration states as of December 2013. The authors find that while some quality domains are well represented, others are not. Quality-of-life measures are notably lacking, as are informative, standardized measures of long-term services and supports.